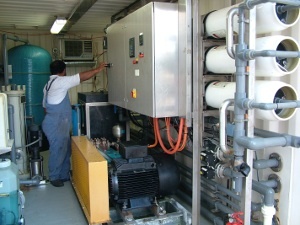 Pacific island countries will continually be challenged to develop and maintain a sustainable and economically viable supply of fresh water. The island nations have traditionally been dependant on ground and surface water as well as rainfall as their primary source of supply. This is still true today, but increased population growth, economic development and irregular rainfall caused by changing weather patterns as well as climate change have placed a tremendous strain on these traditional water supply sources, according to the SPC, Applied Geoscience and Technology Division, Deputy Director for Water and Sanitation, Marc Overmars. So said Dr Wolf Forstreuter, SOPAC’s Remote Sensing and GIS Specialist. Dr Forstreuter has been responsible for the on-going delivery of the EU-funded programme to assist South Pacific Utility companies with GIS. 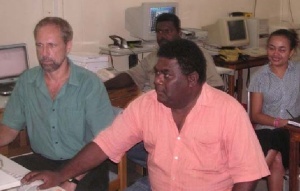 The programme was first introduced in Tonga, closely followed by the Solomon Islands, Fiji and a similar programme later for Samoa and Tuvalu. 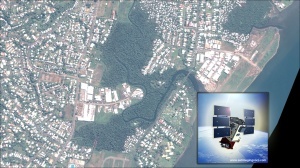 GIS (Geographical Information Systems) is a computer-based tool, to collect, combine and overlay information in the form of easily understood maps constructed from up-to-date-satellite images and field data. 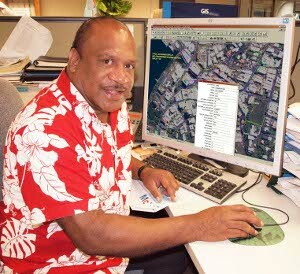 “Satellite technology has made an enormous improvement to our operations,” said Mr Robinson Wood, GIS Supervisor, Solomon Islands Electricity Authority (SIEA). 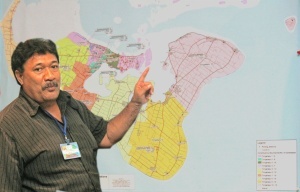 In Suva recently to participate in the week long Geographical Information Systems (GIS)/Remote Sensing User Conference held at the Holiday Inn, Mr Wood said that his involvement with GIS began in 1998, when European Union funding made it possible for the Authority to acquire its first equipment and software as the basis of developing the use of GIS in the organization. 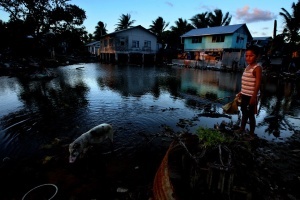 The small Polynesian island nation of Tuvalu has been the focus of climate change impacts for years. The four reef islands and five true atolls that make up Tuvalu only just break the surface of the surrounding Pacific Ocean and have an average height of 1 metre above sea level. Tuvalu’s geography and location poses many challenges to the people that live there. The atolls are regularly inundated by high tides and storms and freshwater is scarce. The contamination of groundwater from septic pollution, salt water intrusion and piggeries means rainwater is the only reliable source of drinking water. Population growth and development has resulted in food security issues and problems with waste management. A SOPAC produced film looking at the connections between climate change and water has won third place at an international short film competition run during the recent 16th Conference of Parties to the United Nations Framework Convention on Climate Change (COP 16) in Cancun, Mexico. The film, “Modern Day Uab”, was created in partnership with Palau’s Roll’em Productions, and combines animation and interviews to link traditional Palauan folklore to the challenges Micronesia faces to protect its water supplies from increased climate variability. The video was presented to thousands of participants in the “Dialogues for Water and Climate Change” session at COP 16. SOPAC member countries have been encouraged to use satellite image data as an essential tool to help in national development, management, security, and protection. Dr. Forstreuter said that most of the data sent from a satellite is used in Geographic Information Systems (GIS) that map targeted areas where a country requests specific information. I bid all our readers ‘Seasons Greetings’ as we move closer to Christmas in 2010. This has been another busy year and the Pacific DRM Partnership Network continues to evolve and provide services and support to the Pacific island countries to address issues of vulnerability and risk. So much has been done by so many in 2010 and we hope to bring you some of the exciting stories in this issue of ‘Footprints’. As we wind down this year and move into 2011 there will be a number of changes that will be experienced. SOPAC as an independent regional intergovernmental organisation will from 1st January cease to function as a separate organisation and becomes the ‘Applied Geoscience and Technology Division of the Secretariat of the Pacific Community (SPC). NADI, Fiji -The first Joint Meeting of the Pacific Platform for Disaster Risk Management and Pacific Climate Change Roundtable is being held 8–11 July at the Sofitel Hotel in Denarau, Nadi, Fiji. 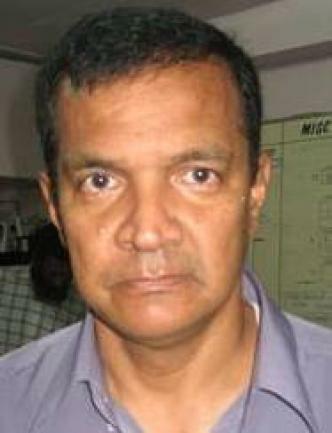 Michael Petterson, Director of the Secretariat of the Pacific Community (SPC) Applied Geoscience and Technology Division, says the joint meeting demonstrates the fact that the region is now leading on the integration of disaster risk management and climate change adaptation efforts. Petterson says joint national action plans (JNAPs) integrating climate change and disaster risk management provide countries with a powerful planning tool to help them consider disaster and risk across a range of ministries. ‘At the end of the day, if your house falls down because of a climatic or another type of disaster, you don't care initially about the cause – you just want help. Experts in climate change and disaster risk management are seeking ways to work together to make the Pacific a safer place. The JNAP offers a roadway for deciding priorities, actions and partnerships, and several [country representatives] have shared their personal satisfaction with how this tool is now supporting a whole raft of government thinking,’ he says.